My flight out of Kansas City got delayed. I arrived at PHX at around 10:00 PM -- about an hour after my flight to Vegas was supposed to leave. Next flight out of here? 7:30 AM or so. Decisions, Decisions... Do I take US Failways up on their offer of a hotel room? It's only a 9 hour wait. No. I set up camp. First, there's a seriously annoying problem with my MacBook. For some reason, it refuses to connect properly to Cisco captive-portal access points. It'll get a DHCP address and route, but when it goes to load the "I accept" page, it can't get to it. This happens EVERYWHERE I run into "Cisco Web Authentication". That happens to include the free WiFi at PHX airport. 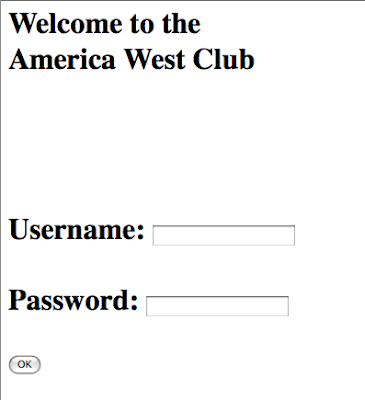 But... we have another wonderful captive portal as well, the private one for US Failways and America West (now merged). How lame is this login screen? Would you pay $120 for 90 days or $315 per year to get access to this super-elite traveler's club? I would kick someone in the nuts if I paid that kind of cash and got this as the login screen. Every page you try to load, even via https, brings this page up. 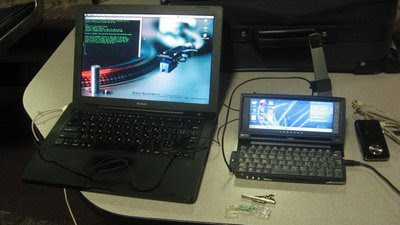 Oddly, I fired up my proxy script that simply launches an SSH session to my house (with a few ports forwarded to tunnel web proxy, instant message and IRC traffic) and told it to connect to port 443 (https) of my home firewall. I have an SSH listener on port 443 since I have no use for SSL at home. DefCon is less than a day away. Hope I run into some of you.